But we do not want you to be ignorant, brothers, concerning those who have fallen asleep, so that you may not be grieved just like the rest who have no hope. For if we believe that Jesus died and rose again, so, too, God will also bring those who fell asleep through Jesus with him. For this is what we say to you by [the] word of [the] Lord: We, the living, who survive into the parousia of the Lord, will certainly not precede those who have fallen asleep. For the Lord himself will descend from heaven with a commanding call, with a voice of [the] archangel and with a trumpet of God, and the dead in Messiah will rise first. Thereupon we, the living who survive, will be snatched away in clouds together with them, to meet the Lord in the air; and so we will always be with [the] Lord. Consequently keep comforting each other in these words. As for the times and the seasons, brothers, you need nothing to be written to you. For you yourself know very precisely that [the] Day of the Lord is coming exactly as a thief in the night. When they are saying "Peace and Security", then sudden calamity will overtake them, just as the pang of distress upon a pregnant woman, and they will by no means escape. However, you, brothers, are not in darkness so that the day would surprise you as a thief, for you are all sons of light and sons of the day. We belong neither to the night nor to the darkness. See! I tell you a secret: We will not all fall asleep, but we will all be changed. In an indivisible moment, in the twinkling of [an] eye, at the last trumpet. For the trumpet will sound and the dead will be raised up incorruptible and we will be changed. But when this which is corruptible puts on incorruption and this which is mortal puts on immortality, then the saying will come to pass that is written: “Death is swallowed up to victory”. For we know that when our earthly house, this tent dwelling, is dissolved, we will have a building from God, a non-handmade, eternal dwelling in the heavens. For in this [tent dwelling] we groan, eagerly desiring to put on the one for us that is from heaven; if at least we are dressed, we will not be found naked. For we who are in this tent are sighing, burdened as we are. After all, we do not want to be undressed, but to be clothed, so that the mortal can be swallowed up by life. He who just prepared us for that [is] God who gave us the pledge of the spirit. For our citizenship exists in the heavens, from which place we also earnestly expect a saviour, Lord Jesus Messiah, who will refashion the body of our humiliation to be conformed to his glorious body, according to the operation of the power that he is capable to subject all things to himself. 1:10 >> To await his Son from the heavens, whom he raised from the dead: Jesus, who delivers us from the coming wrath. 2: 19-20 >> For who is our hope, or joy, or crown of glory? Is it not even you, before our Lord Jesus at his parousia? Certainly, you are our glory and joy. 3:13 >> That he might strengthen your hearts, blameless in holiness before our God and Father at the parousia of our Lord Jesus with all his saints. But here, in 4:13 to 5:5, Paul is first referring to Jesus' own resurrection that he had preached to the Thessalonians and in which they themselves too had come to believe. Now, when Jesus was resurrected, all who have fallen asleep in union with him will also be resurrected. Then Paul takes away the fear of some who apparently thought that in the time of Jesus' presence [his parousia] only the living would be united with him. His reaction: By no means! It is true that the last generation of Christians will have the great privilege, like Enoch, not to experience consciously the [Adamic] death. Why? Because they will be changed, in a moment, out of the present [physical] life into a spiritual nature. However, those who belong to that last generation will by no means precede the dead. On the contrary! The dead Christians will rise first. Then, when the dead and the living are, as it were, in the same position, all will together be snatched away in clouds [of invisibility] to meet the Lord in the air. This shows that the dead, in turn, also do not precede the living. Compare Gn 5:21-24 and 1Ko 15:51-54 . 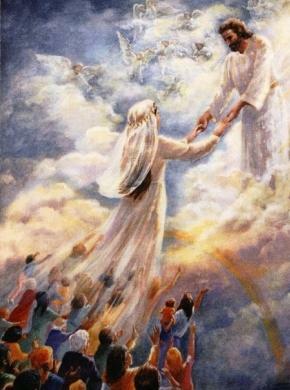 At the Rapture, therefore, all members of Jesus' Congregational Body will meet him, the Lord, in the air. The Greek term εις απαντησιν, used here, is found elsewhere in the NT three times, namely in Matthew 25:1 and 6, and in Acts 28:15-16. And there also in the meaning of meeting and returning together. When, for example, the brothers from Rome had met Paul as far as the Marketplace of Appius and the Three Taverns, they then returned to Rome together with him. This is precisely how, at the Rapture, the entire Christian Congregation will meet the Lord in the air to then rejoice in his company forever. Never again will they be separated from him. However, indeed they will – at the end of the 70th Yearweek for Israel - return to earth with him, namely when he is made manifest to the world in his glory. However, both in Rm 8:19 and in Ks 3:4, it has been announced beforehand that they will then be made manifest [or: revealed] with him in glory. In the issue of the Rapture we are compelled indeed to bring back in our memory Enoch. Why? Because of faith Enoch was transferred so as not to see death, and he was found nowhere, because God had transferred him. For before his transference he received testimony that he was pleasing to God. So Henoch was transferred without having to taste death. To which destination? Apparently, in his unique situation, to the moment of his resurrection, the resurrection of the righteous, which also will be a resurrection of life (Acts 24:15 and John 5:29). When Enoch returns to (permanent) life on earth, he will experience it as if there had been no interruption in his life course. However, what Enoch experienced, in a sense also is a reference to what Jesus' Congregation will experience at his parousia, at least for those members who will remain alive until that unique event. The last generation of Christians will suddenly be untraceable for those who remain behind on earth. In that respect, they certainly share the experience of Enoch. When God took him away (M), or transferred him (LXX), he was found nowhere. Apparently the people in Henoch's environment have been looking for him for some time. Without seeing death - or 'tasting' it - the final members of Jesus' Congregational Body will also be transferred'. In an indivisible moment. Similar to a blink of the eye, they will be changed in nature from one moment to the other (1Cor 15:51-52). It can hardly be otherwise or that event will become an important learning moment for humankind that is left behind on earth, especially for Israel's Remnant. (For the teaching about Israel’s future Remnant, see Isaiah 10:20-22). Until that time Israel - as a people - will have despised Jesus (for them Yeshua) as her Messiah. But then they will come to know that the Christian congregation was indeed pleasing to God, precisely because its members lived by faith towards their Messiah (Masjiach), and walked on that basis in righteousness with God (Col 1:9-10). Tell us, when will these things be and what is the sign of your parousia and of the completion of the age? (Mt 24:3). Mt 24:15 marks the special event on the half of the 70th Yearweek, when the abomination of desolation will appear in the (rebuilt) temple at Jerusalem. Since then the impotence of that antichristian 'messiah' will come to light - to act as a 'saviour' - he will turn, in all his demonic vehemence, against the godly, Jewish Remnant. Because he will then realize very well that his false 'game' will be over. Consequently, he will take an ultimate step: He installs himself as the foretold devastating abomination in the Most Holy of the then existing temple complex, probably the rebuilt Third Temple. The transition to Chapter 5 seems considerable, but on closer examination, it makes sense. When the Rapture of the Christian, heavenly Congregation takes place, one can know with certainty that the parousia of the Lord Jesus Messiah also had its start. Obviously, the question then arises: When can we expect the parousia? As for the times and the seasons, brothers, you need nothing to be written to you. For you yourself know very precisely that [the] Day of the Lord is coming exactly as a thief in the night. When they are saying "Peace and Security", then sudden calamity will overtake them, just as the pang of distress upon a pregnant woman, and they will by no means escape. But know this: If the master of the house had known in what watch the thief would come, he would have stayed awake and would not let his house be broken into. Therefore, you also show yourself ready, for in an hour when you would not think so, the Son of Man comes ( Mt 24:27, 37-39, 43-44). Because that Day will come to the world as a thief in the night, the people of the world will not discern any indication in that direction. On the contrary, because of general disbelief in a possible intervention by a divine power, they will take no notice. Because they regard every superhuman action as unreal, they act as is customary to them, despite the stormy succession of events during the Day of the Lord or the parousia. For those to whom Jesus addressed on Tuesday afternoon 11 Nisan of 33 AD - over the heads of his former Jewish disciples - namely to their counterparts of the End Times, the Jewish Remnant, his prophetic words contain a serious warning. Danger is imminent. Why? And what kind of danger is meant? The following: When the vast majority of the world will not discern the parousia and the people in general will not pay any attention at all - as was the case with the Flood-generation - what guarantee is there that in the End times a Jewish minority will be shaken awake? To what supernatural sign in particular could they look forward? μια παραλαμβανεται και μια αφιεται . Then [at the parousia] there will be two in the field, one [man] will be taken along and one [man] left behind. Two will be grinding with the mill, one [woman] will be taken along and one [woman] left behind. Do not let your heart be troubled. Believe in God, believe also in me. There are many abodes in my Father's house - if not, I would have told you - because I am going to prepare a place for you. And when I go and prepare a place for you, I am coming again and will take you along to myself, so that wherever I am you also may be. In both cases for take along Jesus used the verb παραλαμβανω, as is also the case in Matthew 24 in his End Time speech on the Mount of Olives. At his return, his parousia, the members of his Congregational Body would move in with him, in the House of his Father. See: in the House of my Father, there are many dwellings (Automatic Google translation). That will be an important learning moment for humankind who will remain behind on earth, especially for Israel's Remnant. Which lesson in particular should the members of that Rest take to heart? The principle that the author of the Letter to the Hebrews immediately connects with Enoch: For without faith it is impossible to please well, for he who approaches God must believe that He is and that he becomes a Rewarder of those who earnestly seek him (Hebrews 11:6). Israel as a people will have rejected Jesus as their Messiah until that time; but then they come to know that the Christian congregation was indeed pleasing to God, precisely because its members lived by faith towards Messiah Yeshua (Jesus), and on that basis walked in righteousness with God . But let us return to Yeshua’s ‘Body’ that is in expectation of the Rapture. To which sign in particular can that last generation of the 'living' look forward? When they are saying "Peace and Security", then sudden calamity will overtake them, just as the pang of distress upon a pregnant woman, and they will by no means escape. A meaningful signal will therefore be given, just before the Rapture. There will be so-called peace and security! We purposely write so-called! After all, we can easily see that in the current world there is no real peace and security available, nor even possible! However, people in general will only want to be reassured by such a thought or assertion, instead of observing it as a signal from God. Nevertheless, a signal of that content will be heard. The wise men have become ashamed, terrified; they will be caught. From the smallest to the greatest, everyone is making unjust profits; from the prophet to even the priest, each is acting deceitfully. And they try to heal the breach of the daughter of my people superficially by saying, There is peace! There is peace! While there is no peace. Instead of peace, unbelieving Israel - apparently together with the whole world of humankind - will rather suffer a sudden calamity, indicating that peace and security are fiction. 1.) While it is true that, according to 1Thess 5:3, a sign for that event will be given (Peace and Security) - apparently just before the time of the Rapture - the apostle would later add a second sign to it in 1Cor 15:51-53 >> Everything will take place at the last trumpet (again an automatic Google translation of the study by that title). 2.) The phrase When they are saying "Peace and Security" in verse 3, is vague. Who are the ones called they? The only other group of religious people referred to in the Letter to the Thessalonians - beyond the members of Jesus' Congregation - are the stubborn Jews, mentioned in 1Thess 2:14-16. Concerning them Paul wrote: For you, brothers, became imitators of the congregations of God that are in Judea in Messiah Jesus, since you also suffered the same things by their own tribesmen as they also did by the Jews, who even killed the Lord, Jesus, and the prophets, and that drove us [like beasts]. They are not pleasing God and are hostile to all people. However, we do not exclude that with they a much wider audience can be meant: All in the present world who are eagerly looking forward to peaceful and safe conditions. However, given the increasing radicalization within certain religious circles and the aggressive attitude of many in general, there is little reason for optimism in this respect. Compare 2 Timothy 3, in which is prophetically recorded how at the dawn of the End Times - the so-called last days - the dominant attitude to life will be among the general public. The sudden calamity (or doom) will only be the beginning of ominous developments that will then be initiated. Developments that most probably also relate to the appearance of the tyrannical Antichrist, also announced a long time ago. I will drive the northerner far away from you. I will disperse him to a dry and desolate wasteland, with his face toward the eastern sea and his rear guard toward the western sea. The foul smell from him will ascend; the stench from him will keep ascending; for he will do great things (Joel 2:20). Dan will judge his people as one of the tribes of Israel. Dan will be a serpent on the road, a horn-snake on the path that bites into the heels of the horse, so that its rider falls backward (Gen 49:16-18). 3.) The antichristian power is (literally) demonic. There was hope for peace , but nothing good; at a time of healing, but see! horror ! The sniffing of his horses was heard from Dan .The whole country was shaking at the sound of neighing his stallions. And they come and digest the land and that what it fills, the city and its inhabitants. For behold, I send snakes, venomous snakes among you , that can not be defiled , and they will certainly bite you, says YHWH. The demonic nature of the Antichrist is proven in the study The role of demons in the End time However, also that study is by Google automatically translated from Dutch into English. Then the spirit lifted me up between the earth and the heavens, and in visions of God he brought me to Jerusalem, to the entrance of the gate of the innermost court which is turned to the north, where was the dwelling place of the symbol of jealousy which provokes to jealousy. The foretold sudden calamity will occur as unexpectedly as usually the first woe in a pregnant woman. Compare: Isaiah 13:6-8 and Micah 4:9-10. But even with the use of that image, the apostle refers to Jesus' End-time speech according to the chapters 24 and 25 of the Matthew Gospel. as a first answer that they should above all be wary of deceivers. For many would pretend being the true Messiah, in the End Times resulting in the appearance of the most dangerous of all, the demonic Antichrist. He who will manifest himself as the Messiah for which the Jews - especially those who stubbornly keep rejecting Jesus - have been waiting for so long. Once that Pseudo-Messiah has publicly made his entrance, in his wake the one calamitous event after another may be expected: Nations and kingdoms that will stand up against each other and wage war; widespread famine; also large earthquake activity. However, according to Jesus all those events will only be a beginning of pains of distress. And I saw when the Lamb opened one of the seven seals, and I heard one of the four Living Beings saying as with a sound of thunder: Come! And I saw and look a white horse and the one [the Pseudo-messiah ] sitting upon it having a bow, and a crown was given to him; and he went forth, conquering, and that he might conquer. And when he opened the second seal, I heard the second Living Being saying: Come! And another horse went out, fiery red. And to him sitting upon it was given to take the peace out of the earth, so that they will slaughter one another; and a great sword was given him. And when he opened the third seal, I heard the third Living Being saying: Come! And I saw, and look a black horse and the one sitting upon it having a scale in his hand. And I heard as a voice in the midst of the four Living Beings saying: a quart of wheat for a denarius and three quarts of barley for a denarius, and do not harm the olive oil and the wine. And when he opened the fourth seal, I heard the voice of the fourth Living Being saying: Come! And I saw, and look a greenish yellow horse, and the one sitting upon it named Death. And the Hades was following with him. And was given to them authority upon the fourth part of the earth, to kill with sword and with famine and with death and by the beasts of the earth. • The Christian Congregation has then already experienced the Rapture, prior to that entire calamity, since her members are seen around the throne of God in heaven under the sign of the 24 Elders. See: What is the identity of the 24 elders in the Revelation? • According to Revelation 1:10, the world will then find itself within the period that is called The Day of the Lord. According to the Greek text: I [John, an exile on the island of Patmos] became in spirit in the Day that belongs to the Lord [εν τη κυριακη ημερα]. The sudden calamity that is announced in connection with the call for Peace and Security [1Thess 5] , could very well be associated with Acts 27, but then in antitypical sense. Luke - one of the 276 sailors of the ship that came from the Egyptian Alexandria, transferring the apostle Paul, together with other prisoners, to Italy - reports in Acts 27:33-44 the stranding of that ship and its total disruption on the coast of the island of Malta. The whole story strongly suggests that the ship itself represents the world-oriented Christendom in antitypical sense. When that apostate system then suffers complete shipwreck and, at the same time, the true Christian Congregation disappears from the scene of the world through the Rapture, then a tremendous spiritual vacuum will arise. Of course an ‘excellent’ opportunity for the Antichristian power to fill that spiritual vacuum with his appearance. Compare Two Thessalonians 2. In the next and final chapter of Acts (28) we apparently find even more clues for that approach. When Paul had gathered a bundle of sticks and laid them on the fire, a viper came out because of the heat, and fastened on his hand… However he shook off the creature into the fire, and wasn’t harmed… and [the natives] said that he was a god. The chief man of the island, named Publius, received us, and courteously entertained us for three days [three being the number for resurrection]. It happened that the father of Publius lay sick of fever and dysentery. Paul entered in to him, prayed, and laying his hands on him, healed him. Then when this was done, the rest also who had diseases in the island came, and were cured [maybe a figure of the ‘sheep’ mentioned in Mt 25 those among the Gentile nations who help the members of the Jewish remnant during the Great Tribulation]… After three months, we set sail in a ship of Alexandria which had wintered in the island, whose sign was Sons of Zeus [another indication for demon activity among the sea of humankind, under the direction of Satan. Zeus being the supreme ‘god’]. At the end of the chapter, the Jewish End time remnant appears. The Holy Spirit spoke rightly through Isaiah, the prophet, to our fathers, saying, go to this people, and say, in hearing, you will hear, but will in no way understand. In seeing, you will see, but will in no way perceive. For this people’s heart has grown callous. Their ears are dull of hearing. Their eyes they have closed. Lest they should see with their eyes, hear with their ears, understand with their heart, and would turn again, and I would heal them.